Determine the full name of the testator, his date of death and the county in which he resided during his final years. Call the court in that county and ask about probate search procedures. Large or modern court systems make it easy to locate probate files with automated phone lines or Internet sites. 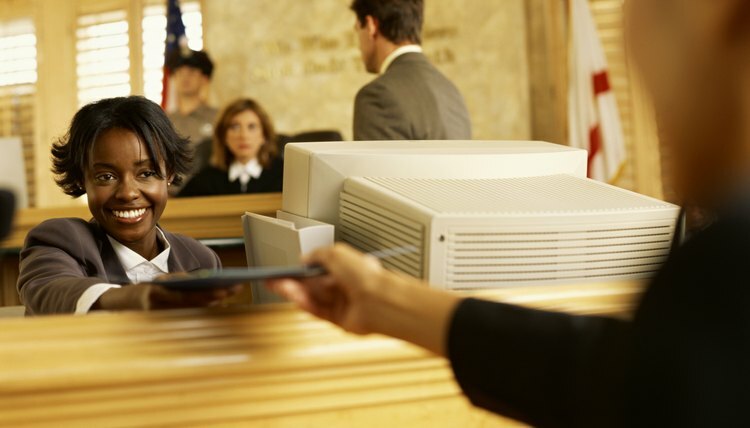 In other jurisdictions, you visit the court clerk's office to inquire. By one of these means, determine which jurisdiction probates the will and the number of the probate file. Visit the court probating the file. Present yourself at the court clerk's window and provide the probate file number. The court clerk locates the file and allows you to look at it either at the window or in a nearby reviewing area. Take whatever time you need to peruse the file but do not remove a document from the file or attempt to remove the file from the courthouse. Severe civil and criminal penalties apply for theft of court documents. Review the last will and testament, one of the early probate filings, but review the remainder of the file as well to ascertain whether the executor successfully proved the will. If the court found insufficient witnesses or upheld a will challenge, it invalidates the original will. In that case, an earlier will moves into probate or, if none exist, the estate passes by intestate succession. Note documents of interest and ask the court clerk to make copies for you. Pay the per-page fee. Ask the court clerk the procedure to locate a will if probate is finished. Recently closed probate files remain in the computer system and the clerk locates them like open files. If the person whose will you seek died some years earlier, different procedures apply. Modern courts store older documents on microfilm, accessed by a computerized index system, but many jurisdictions keep old documents in folders, organized either chronologically or alphabetically.